The Brothers of Kappa Sigma would like to invite you to the Kappa Sigma house for Fall Rush 2012. The house is located at 1120 SW 9th Road, right behind Sorority Row. See the Rush page of our website for a map and more information about the rush process. We highly encourage anyone interested to join us for either lunch, dinner or the evening rush events any day throughout the week. So, Come out for some great food, and let us show you that we truly have the strongest brotherhood on campus. RUSH WEEK is Tuesday, September 4th- Friday, September 7th. The Brothers of Kappa Sigma would like to invite you to the Kappa Sigma house for Spring Rush 2012. The house is located at 1120 SW 9th Road, right behind Sorority Row. See the Rush page of our website for a map and more information about the rush process. RUSH WEEK is Monday, January 16th- Friday, January 20th. Come out, enjoy some great food, and let us show you why our brotherhood is truly the strongest on campus. -Lunch at the house is from 11-2. -Dinner at the house will be served from 5-7. -Evening Events are from 8-11. Come meet the brothers of the Kappa Sigma Fraternity at the University of Florida for a relaxing evening out by the grill. We’ll have burgers, brats and hot dogs. This is a great opportunity to meet brothers and if you’re an incoming freshman, to get to know more people on campus. The BBQ will take place at the Kappa Sigma house located at 1120 SW 9th Road right behind Sorority Row. The event is Saturday, July 9th from 6:30-8:30 pm. Check out the Rush section of our website for a map and more information about rush and fraternity life. This past week we formally initiated 13 new brothers into our chapter. Congratulations to Brendan D’Isernia, Jiyung Park, Alex Marina, Michael Pascual, Wade Bayless, Kevin Nowakowski, Bhavik Patel, Michael Keller, Joey Lopez, Rip Chambers, Ignacio Gallardo, Justin Lucas, and Branden Barlek! The Upsilon pledge class of Spring 2011 worked very hard together as a pledge class, which will carry over strongly to our brotherhood. 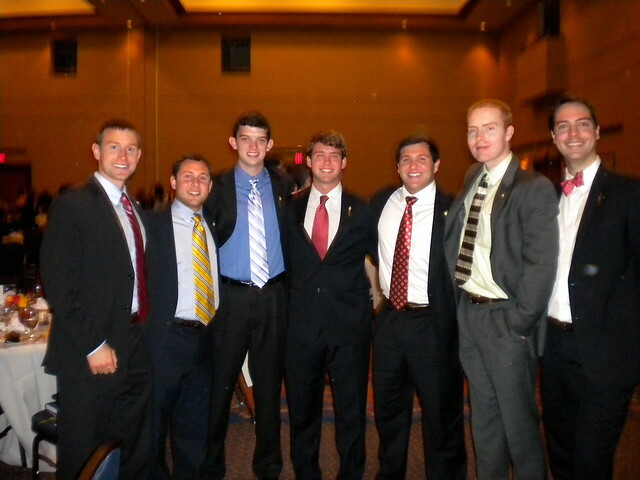 I have attached a picture we took after chapter of the Upsilon pledge class with their Pledge Master, Mike Grimes. Congratulations to brothers Branden Clarke, James Thompson, and alumni brother Paul Pakidis for being tapped into Florida Blue Key this past weekend. Florida Blue Key is the most prestigious leadership honor at UF and in the state of Florida. We now have 7 active members currently in FBK! The Brothers of Kappa Sigma will be hosting Spring Rush at the Kappa Sigma house from Monday, January 17 to Saturday, January 22. We are located in our relatively new house at 1120 SW 9th Road, right behind Sorority Row. For a detailed map and more information see the Rush page of our website. Lunch at the house is from 11-2. Dinner at the house will be served from 5-7. Evening Events are from 8-11. 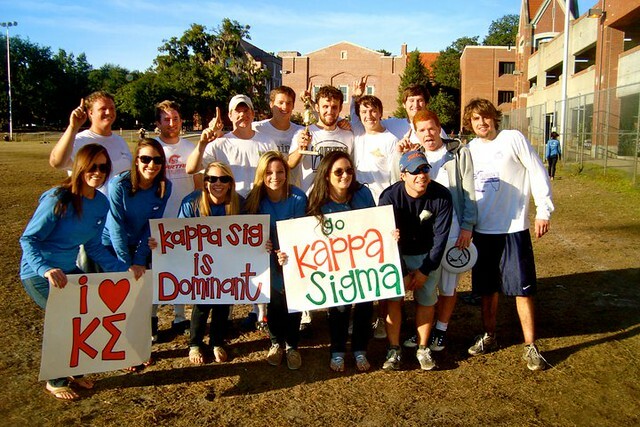 Before the end of the Fall 2010 semester, the Brothers of Kappa Sigma Delta-Delta ended on a high note by winning both an intramural championship and a sorority philanthropy. First, the Kappa Sigma team was named intramural tennis champions among all fraternities. Also, the Kappa Sigma team won Alpha Chi Omega’s Great Escape ultimate frisbee tournament, going undefeated and recording multiple shutouts. Congratulations to all brothers that helped accomplish these great things for our chapter. This past Saturday, November 6th, we initiated 24 new brothers into our chapter. This now puts our active total over 100 brothers, and only 2 brothers are graduating this Fall! Also in attendance were Michael Comeau’s father and Forest Halualani’s stepdad who are both Kappa Sigmas. Brother Paul Gamble,our District Grand Master, was also in attendance. The Brothers of Kappa Sigma recently celebrated the dedication of Hough Hall with Brother and Delta-Delta Alumni Bill Hough. The building will be used for graduate studies in the College of Business at UF. The dedication involved a ceremony and a speech by Brother Hough. 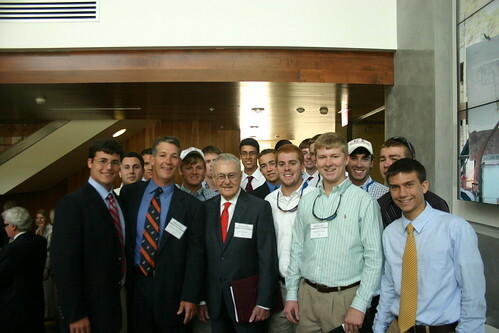 A large group of brothers were present to support Brother Hough and congratulate him on the building’s success. 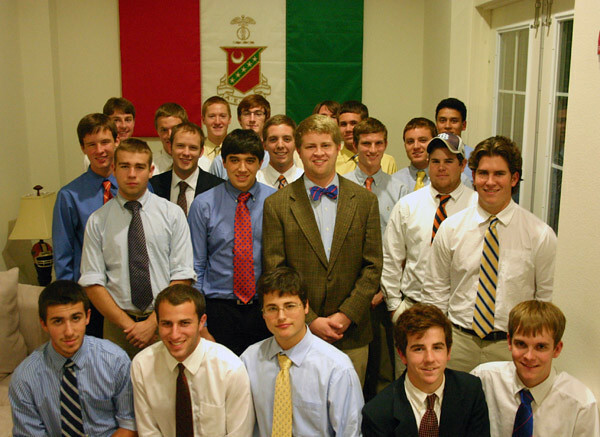 You are currently browsing the Kappa Sigma - Delta Delta (UF) weblog archives.